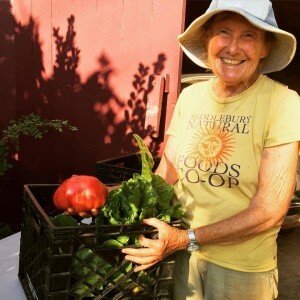 I’ve been dazzled week after week this summer by the bounty of an organic CSA share with Susan Willis of Bitta-Blue Farm in Killingworth, Connecticut. I love (and sometimes dread!) the insistent demands of a CSA, which force me to experiment and explore new types of produce. Susan makes the whole adventure fun by not only enduring my endless questions each week regarding varieties, but by making preparation suggestions. I took this first photo in hot afternoon sun. I love its imperfect shape and natural dents. This is what a tomato should be. The next day, inside, it was time to delve in. 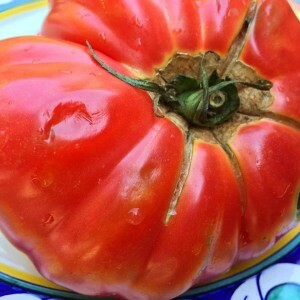 A tomato like this needs no accompaniment at all. I sprinkled some seller’s salt over it. And inhaled. What an aroma! Pure “tomato!” Next the taste. What over-used words can I use to describe it? Luscious? Divine? 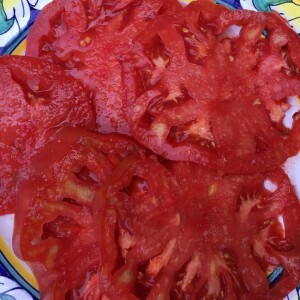 Nothing less than “spectacular.” And it just ruins me for the tomatoes I encounter outside of this season. For now I am going to relish this wonderful variety- and look forward to Susan’s next selection.